A bombie cluster munition on a farm in Khammouane Province, Laos. 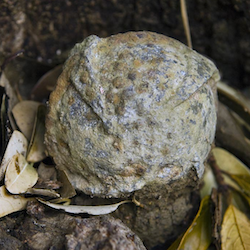 Over the course of nine years and a bombing mission every eight minutes, round the clock, more than 270 million cluster bombs – or bombies – were dropped on Laos. The cluster bombs were a small part of the 2 million tonnes dropped on Laos, almost half a tonne of ordnance for every man, woman and child in the country. Some was aimed at breaking the Ho Chi Minh Trail. The rest was jettisoned by pilots who had been told not to return to base with any bombs left in their planes. The failure rate, as Karen said, was around 30 percent. Unexploded ordnance remains an ever-present threat, and not only during the business of farming. About half the people killed, according a a 2009 report, were going after scrap metal. A scrap metal collector can make $5 a day, compared to the average wage of about $1 a day. And that’s not the only way the bombs are “beneficial”. Many farming families use craters – created by bombs that did explode – as fish ponds, improving both their income and their nutritional status. Casualties have dropped, from about 1450 a year in 1975 to about 350 a year in 2009, but less than one per cent of the land has been cleared. 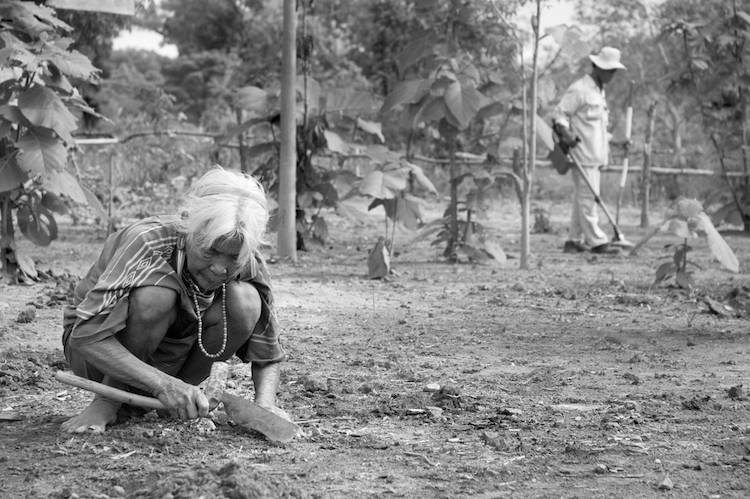 A technician with a UXO Lao bomb disposal team scans for bombs in a woman’s yard as she continues weeding. They work along a new road built atop the old Ho Chi Minh Trail. Eternal Harvest: the legacy of American bombs in Laos has a website and is available from Amazon. I started reading up about bomb crater fish ponds at Nicola Twilley’s Edible Geography. Fascinating accounts of individual farmers bring an otherwise dry FAO field manual on common aquaculture practices in Lao PDR to life. The maps in this online post by Xiaoxuan Lu about her thesis give some idea of the scale of the problem. Karen writes online at The Rambling Spoon and elsewhere. There’s plenty there about restaurants, Lao cookbooks and that nine-day field trip we talked about. The music is a Lao folk tune called Dokmai (Flower) by a group called “Thiphakon (roughly, resonance of angels)”. I found it online.